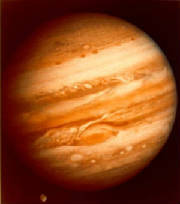 Jupiter is the fifth planet from the Sun and is the largest one in the solar system. If Jupiter were hollow, more than one thousand Earths could fit inside. It also contains more matter than all of the other planets combined. It has a mass of 1.9 x 1027 kg and is 142,800 kilometers (88,736 miles) across the equator. Jupiter possesses 28 known satellites, four of which - Callisto, Europa, Ganymede and Io - were observed by Galileo as long ago as 1610. Another 12 satellites have been recently discovered and given provisional designators until they are officially confirmed and named. There is a ring system, but it is very faint and is totally invisible from the Earth. (The rings were discovered in 1979 by Voyager 1.) The atmosphere is very deep, perhaps comprising the whole planet, and is somewhat like the Sun. It is composed mainly of hydrogen and helium, with small amounts of methane, ammonia, water vapor and other compounds. At great depths within Jupiter, the pressure is so great that the hydrogen atoms are broken up and the electrons are freed so that the resulting atoms consist of bare protons. This produces a state in which the hydrogen becomes metallic. Colorful latitudinal bands, atmospheric clouds and storms illustrate Jupiter's dynamic weather systems. The cloud patterns change within hours or days. The Great Red Spot is a complex storm moving in a counter-clockwise direction. At the outer edge, material appears to rotate in four to six days; near the center, motions are small and nearly random in direction. An array of other smaller storms and eddies can be found through out the banded clouds. Auroral emissions, similar to Earth's northern lights, were observed in the polar regions of Jupiter. The auroral emissions appear to be related to material from Io that spirals along magnetic field lines to fall into Jupiter's atmosphere. Cloud-top lightning bolts, similar to superbolts in Earth's high atmosphere, were also observed. Unlike Saturn's intricate and complex ring patterns, Jupiter has a simple ring system that is composed of an inner halo, a main ring and a Gossamer ring. To the Voyager spacecraft, the Gossamer ring appeared to be a single ring, but Galileo imagery provided the unexpected discovery that Gossamer is really two rings. One ring is embedded within the other. The rings are very tenuous and are composed of dust particles kicked up as interplanetary meteoroids smash into Jupiter's four small inner moons Metis, Adrastea, Thebe, and Amalthea. Many of the particles are microscopic in size. The innermost halo ring is toroidal in shape and extends radially from about 92,000 kilometers (57,000 miles) to about 122,500 kilometers (76,000 miles) from Jupiter's center. It is formed as fine particles of dust from the main ring's inner boundary 'bloom' outward as they fall toward the planet. The main and brightest ring extends from the halo boundary out to about 128,940 kilometers (80,000 miles) or just inside the orbit of Adrastea. Close to the orbit of Metis, the main ring's brightness decreases. The two faint Gossamer rings are fairly uniform in nature. The innermost Amalthea Gossamer ring extends from the orbit of Adrastea out to the orbit of Amalthea at 181,000 kilometers (112,000 miles) from Jupiter's center. The fainter Thebe Gossamer ring extends from Amalthea's orbit out to about Thebe's orbit at 221,000 kilometers (136,000 miles). Jupiter's rings and moons exist within an intense radiation belt of electrons and ions trapped in the planet's magnetic field. These particles and fields comprise the jovian magnetosphere or magnetic environment, which extends 3 to 7 million kilometers (1.9 to 4.3 million miles) toward the Sun, and stretches in a windsock shape at least as far as Saturn's orbit - a distance of 750 million kilometers (466 million miles). Rotating Jupiter and its Atmosphere. This image was taken by NASA's Hubble Space Telescope on February 13, 1995. The image provides a detailed look at a unique cluster of three white oval-shaped storms that lie southwest (below and to the left) of Jupiter's Great Red Spot. The appearance of the clouds, in this image, is considerably different from their appearance only seven months earlier. These features are moving closer together as the Great Red Spot is carried westward by the prevailing winds while the white ovals are swept eastward. The outer two of the white storms formed in the late 1930s. In the centers of these cloud systems the air is rising, carrying fresh ammonia gas upward. New, white ice crystals form when the upwelling gas freezes as it reaches the chilly cloud top level where temperatures are -130°C (-200°F). The intervening white storm center, the ropy structure to the left of the ovals, and the small brown spot have formed in low pressure cells. The white clouds sit above locations where gas is descending to lower, warmer regions. This true color mosaic of Jupiter was constructed from images taken by the Cassini spacecraft on December 29, 2000, during its closest approach to the giant planet at a distance of approximately 10 million kilometers (6.2 million miles). It is the most detailed global color portrait of Jupiter ever produced; the smallest visible features are approximately 60 kilometers (37 miles) across. The mosaic is composed of 27 images: nine images were required to cover the entire planet in a tic-tac-toe pattern, and each of those locations was imaged in red, green, and blue to provide true color. Although Cassini's camera can see more colors than humans can, Jupiter's colors in this new view look very close to the way the human eye would see them. Everything visible on the planet is a cloud. The parallel reddish-brown and white bands, the white ovals, and the large Great Red Spot persist over many years despite the intense turbulence visible in the atmosphere. The most energetic features are the small, bright clouds to the left of the Great Red Spot and in similar locations in the northern half of the planet. These clouds grow and disappear over a few days and generate lightning. Streaks form as clouds are sheared apart by Jupiter's intense jet streams that run parallel to the colored bands. The prominent dark band in the northern half of the planet is the location of Jupiter's fastest jet stream, with eastward winds of 480 kilometers (300 miles) per hour. Jupiter's diameter is eleven times that of Earth, so the smallest storms on this mosaic are comparable in size to the largest hurricanes on Earth. This image of Jupiter was taken with the 2.6 meter Nordic Optical Telescope, located at La Palma, Canary Islands. It is a good example of the best imagery that can be obtained from earth based telescopes. (c) Nordic Optical Telescope Scientific Association (NOTSA). In this Hubble Space Telescope picture, a curtain of glowing gas is wrapped around Jupiter's north pole like a lasso. This curtain of light, called an aurora, is produced when high-energy electrons race along the planet's magnetic field and into the upper atmosphere where they excite atmospheric gases, causing them to glow. The aurora resembles the same phenomenon that crowns Earth's polar regions. But this Hubble image, taken in ultraviolet light, also shows the glowing "footprints" of three of Jupiter's largest moons: Io, Ganymede, and Europa. This image taken by the ion and neutral mass spectrometer instrument on NASA's Cassini spacecraft makes the huge magnetosphere surrounding Jupiter visible in a way no instrument on any previous spacecraft has been able to do. The magnetosphere is a bubble of charged particles trapped within the magnetic environment of the planet. A magnetic field is sketched over the image to place the energetic neutral atom emissions in perspective. This sketch extends in the horizontal plane to a width 30 times the radius of Jupiter. Also shown for scale and location are the disk of Jupiter (black circle) and the approximate position (yellow circles) of the doughnut-shaped torus created from material spewed out by volcanoes on Io. Some of the fast-moving ions within the magnetosphere pick up electrons to become neutral atoms, and once they become neutral, they can escape Jupiter's magnetic field, flying out from the magnetosphere at speeds of thousands of kilometers, or miles, per second. These HST images, reveal changes in Jupiter's auroral emissions and how small auroral spots just outside the emission rings are linked to the planet's volcanic moon, Io. The top panel pinpoints the effects of emissions from Io. The image on the left, shows how Io and Jupiter are linked by an invisible electrical current of charged particles called a flux tube. The particles, ejected from Io by volcanic eruptions, flow along Jupiter's magnetic field lines, which thread through Io, to the planet's north and south magnetic poles. The top-right image shows Jupiter's auroral emissions at the north and south poles. Just outside these emissions are the auroral spots called "footprints." The spots are created when the particles in Io's "flux tube" reach Jupiter's upper atmosphere and interact with hydrogen gas, making it fluoresce. The two ultraviolet images at the bottom of the picture show how the auroral emissions change in brightness and structure as Jupiter rotates. These false-color images also reveal how the magnetic field is offset from Jupiter's spin axis by 10 to 15 degrees. In the right image, the north auroral emission is rising over the left limb; the south auroral oval is beginning to set. The image on the left, obtained on a different date, shows a full view of the north aurora, with a strong emission inside the main auroral oval. Credits: John T. Clarke and Gilda E. Ballester (University of Michigan), John Trauger and Robin Evans (Jet Propulsion Laboratory), and NASA.